The expansive fully fenced front deck with sitting area and weber bbq. The bespoke dining table, by artists, Jai Vasicek. The Third bedroom can be set up as two singles. The kitchen area is the perfect place to make the use of the fantastic local produce. Spend many a lazy day watching the birdlife and the towering paperbark trees. The downstairs living room, perfect space for to chill out in. Having two living rooms allows guests to really chill out and relax when needed. The freshwater rainforest creeks are heaven! Spacious, the best location, and all you will need for the perfect holiday. The Port Douglas Artists' Treehouse is a three bedroom, fully air conditioned, artisan townhouse in the heart of Port Douglas, sleeping up to six people. The townhouse features two living rooms, two bathrooms, and balcony, and fenced grassy courtyard area leading to shared pool. 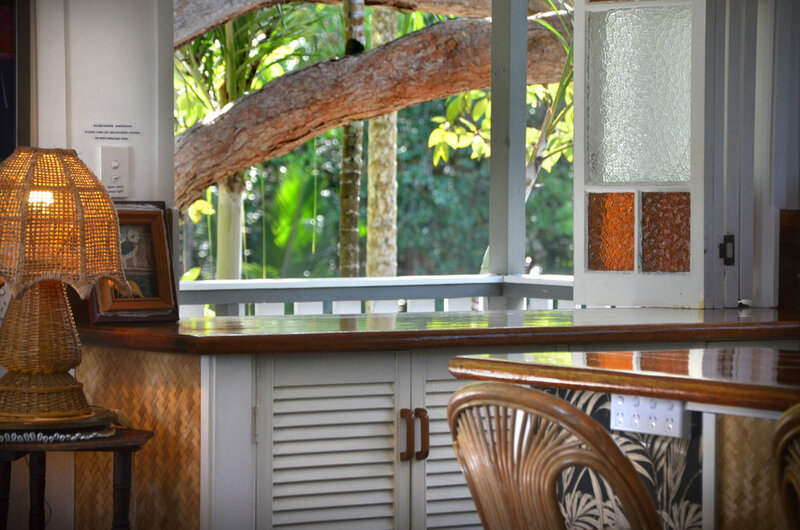 Filled with major collections of inter/nationally renowned artists, and eclectic furnishings, the Port Douglas Artist's Treehouse finds the perfect balance between comfort, and cool, artistic contemporary style with an affordable price. The Treehouse suits families and friends looking for something cool, eclectic, functional and comfortable, with the convenience of being in the heart of Port Douglas, so you can walk anywhere. Its child friendly and children love it - being surrounded by artwork and filled with toys and dvd's. On the second floor, wooden flooring leads to an open plan fully equipped kitchen featuring wooden benches. The kitchen has an electric stove and dishwasher, microwave, toaster, juicer, blender and other appliances. This leads to the dining areas featuring a bespoke dining table with settings for six people. Expansive sliding doors lead to the balcony, bringing the outside in, letting mother nature steal the show. Spend your evenings looking over the towering paperbark trees, watching the hundreds of birds flying past. There is a small study area, a living room area with two three seater couches, DVD player, selection of DVD's, and digital television. There is a stereo with iPod/iphone attachment. A large air conditioner is available if needed. The upstairs master bedroom is also air-conditioned if needed. There is a queen size bed. The room features a wall of louvres, to capture the breeze. The upstairs bathroom has a shower and toilet. Downstairs is another living room that opens up to a front deck and fenced courtyard via french doors. There is a large bookshelf with a range of books/DVD's and games. Another large digital television/DVD player and comfy couch. Having a second living room is a wonderful bonus if there are two families, or children - allowing room to spread out. There are chairs/toys/spades/boards/rugs/towels to take to the beach. The front bedroom can be set up as king or two singles. French doors open up to the balcony and a small sitting area. The third bedroom has a single bed with a pull out trundle bed. The back gate leads to the pool. The pool is shared with eight other properties, however, all mostly residential so the pool is rarely used, and it is most likely you will have it to yourself. The Port Douglas Artists Treehouse is situated in the heart of Port Douglas, you can stroll into the main street in eight to ten minutes or take a walk over to the beach, just a few minutes away. Here you can find a great supermarket with all you should want, a selection of Australia's best restaurants, some cool cafes and a wonderful selection of boutiques. The beautiful Fourmile beach is perfect for long morning walks, and safe for swimming, bike riding, sunning or kite surfing. Feel like heading to the reef? The marina is about eight minutes walk way. A large selction of boats head out to the reef to dive, to snorkel and to fish. The marina also has a few restaurants and shops. If you don't feel like walking to town, just near to the Artists' treehouse is a selection of cheap restaurants and takeaways and an alcohol shop. With plenty of sunshine, beautiful warm seas, refreshing sea breezes and a warm climate all year round, Port Douglas weather is always wonderful. Our warm winter starts in May and finishes in October offering lots of sunshine, fresh breezes and relatively low humidity. Summer is quieter, extends from November to April. The region is refreshed with sporadic tropical afternoon downpours, abundant tropical fruit, and less people. This is a spectacular time of year to come to Port Douglas. The tropical vegetation is abundant and the forests are filled with clear streams and many waterfalls to cool off in. Ocean water temperatures range from 23 degrees Celsius in July to 29 degrees Celsius in February. Thanks to the beautiful Port Douglas weather you can swim all year round. The 'best' swimming season runs between April and October. Between the months of November and March, Port Douglas is home to the box jellyfish, so special swimming enclosures are erected at Fourmile Beach to protect swimmers. Port Douglas is a small village, on the coast of Far North Queensland, Australia. It is situated a spectular hours drive north of the international airport in Cairns. The only place where two World Heritage listed areas sit side by side, Port Douglas offers spectacular tropical landscapes and exhilarating natural adventures. Port Douglas has something for everyone. The balmy tropical climate year around keeps visitors coming back again and again. The distinctive laid back atmosphere, the breathtaking scenery, morning strolls along palm-fringed Four Mile Beach, world championship golf courses, the marina, five star restaurants, local artist's galleries, boutique designer stores, wonderful supermarkets and gourmet food supplies, finished off with relaxing moments in the sidewalk cafes. Port Douglas is a wonderful for a relaxed and safe family holiday. Port Douglas is the perfect place to explore the Great Barrier reef, the world's largest coral system and the world's biggest single structure made by living organisms. Port Douglas is the closest town and departure point to the World Heritage listed Great Barrier Reef, with 12 tours departing daily to the outer reef and Low Isles inner reef areas. The Farmer's Market every Sunday is a wonderful mix of arts, crafts and local produce. There are amazing experiences diving spectacular Great Barrier Reef that can not be missed. Try a refreshing swim in the crystal clear waters of Mossman Gorge, or Spring Creek to revitalise the soul. Go sailing, spend a day lazing on the many (most empty) beaches. Laze the day away on nearby Low Isles. Hike scenic trails to Cape Tribulation where tropical rainforest and coral reef meet. The area is unique, a rainforest that has been in existence for more than 120 million years and contains some plant and animal species not seen anywhere else in the world. Take a cruise up river and come face to face with large crocodiles and pythons in their natural habitat from the comfort and safety of a cruise boat... Or just spend quiet days lazing about in the Port Douglas Artist's Beach House. To avoid service fees, please book direct using this website. We take back to back bookings, so please get in touch before you book flights. High Season dates: Christmas, Easter, 1st May to 1st December. At the Artists Treehouse, we have a seven night minimum in the High Season. Our rates are $315 per night. Low Season dates: Late January, February, March, April (except Easter), later November, Early December. At the Artists' Treehouse we have a five night minimum in the low Season. Our rates are $225 per night. Bookings must start on the day the previous booking leaves, so please get in touch before you book tickets. We have strict cancellation policies so please be sure of your dates. Payment is a twenty percent non refundable deposit and a non refundable balance two months before arrival. We strongly advise travel insurance as a lot of life happens while making holiday plans. No parties, no loud noise after 9pm, no smoking, no shoes inside, please leave the Artists' Treehouse in a tidy state. Please be aware this is a residential block and not a resort. Please don't use pool at night, or if you are using, please be quiet as not to disturb other tenants.